The Lekue Microwave Bacon Cooker with Lid makes it easy to cook bacon in LESS THAN 3 minutes. It comes with a clear lid so it's easy to see what's cooking inside and there's No Splattering, there's No Mess so cleanup is super easy. 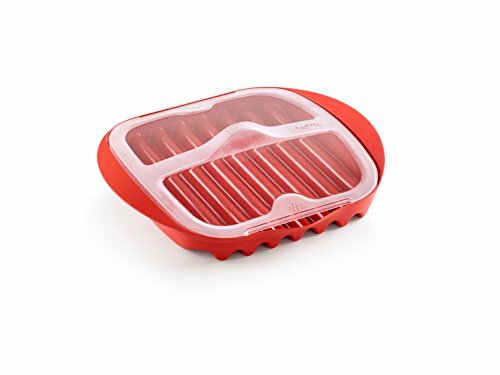 The Lekue Microwave Bacon Maker Cooker is designed with deep grooves which helps drain the fat away and cook the bacon to its perfect crispness. Once cooked, the integrated spout allows you to pour and remove any grease in the cooker. Dishwasher safe, easy to clean, all pieces are BPA free. Dimensions: L 11.02"x W 9.8"xH 2.3".